On Sunday 2nd September 2016, London commemorated the 350 year anniversary of the Great Fire of London. The fire itself was significant, due to the remarkable size, and the lack of control held over it. But, the events that occurred at the beginning of September 1666, would also change London as a city. The story goes, that at midnight on Sunday 2nd September 1666, a fire broke out on (or near) Pudding Lane (mentioned in ‘Towers of London’ walk), coming from Thomas Farriner’s bakery. The delay of decisive action helped spread the fire into the adjacent housing. The fire spread to more flammable buildings on the river front. Later that Sunday morning as the fire spread, all attempts to stop the fire were forgotten. The fire managed to burn London Bridge, but had not touched the south side of the river. By Monday the fire had spread to the housing belonging to the bankers. There was a rush to collect all their gold, before escaping to the river on boats. James, the Duke of York, and King Charles II brother started the attempts to quell the fire. The royal palace, Baynard’s castle (mentioned in ‘Sweet Thames London’ walk) was destroyed that day. On Tuesday James was hard at work, trying to create firebreaks by blowing up houses. The fire had passed the river Fleet, a gap in the streets that was not able to suffocate the fire. The fire reached Cheapside, an affluent shopping street. In the evening, St Pauls Cathedral was on fire. Christopher Wren was restoring the landmark, and the wooden scaffolding had caught fire. Fortunately by Wednesday 5th September, the firebreaks started to be effective. There was much destruction, and those who were left homeless took refuge outside the City of London. It is said that the death toll was fairly low, but may not have accounted for the poor who were killed. The fire of London was a turning point in history. The architecture, and layout of the city changed. Streets became wider, and houses were made from stone. This was a preventative measure, but a significant change to London. From the ashes, there were benefits to the Londoners. 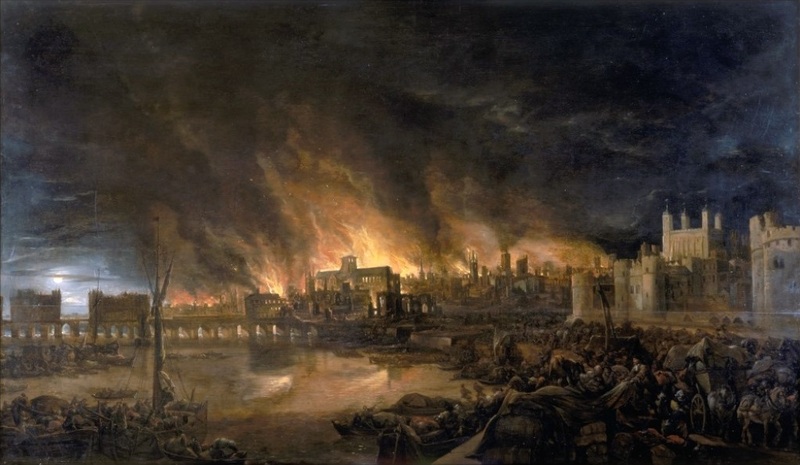 The fire helped remove traces of the Great Plague of London. Today the Monument standing in the City of London, marks as a tribute to the Great Fire.